JEGS 51600 - Small Block Chevy Harmonic Balancer/Damper 6.25"
JEGS 51634 - Big Block Ford 429-460 Harmonic Balancer/Damper 6.76"
The basis for TCI's patened , revolutionary Rattler torsional vibration absorber originally stemed from absorbers used on piston type aircraft engines. By absorbing vibrations, as opposed to merely dampening, the Rattler is able to effectively control amplitudes of vibration and angle of crankshaft twist over a broad RPM range. By controlling engine vibration, engine crankshaft and bearing life are substantially increased as a result. Smoother operation also increases valvetrain stability and lengthens the life of valvetrain components. 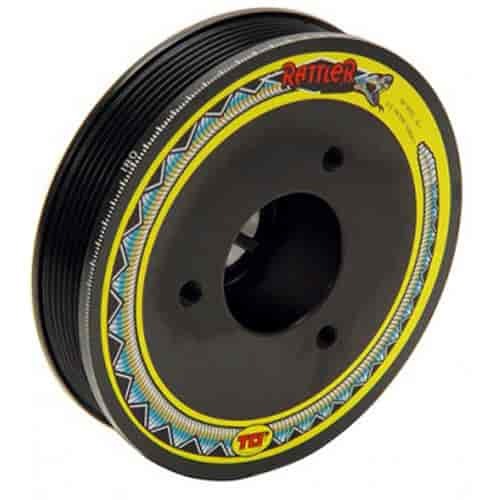 When compared to other dampers of the same size and material, Rattler is comparable in weight, does not utilize elastomers or viscous fluids and requires absolutely no maintenance. The timing marks are etched into the body of the unit, so they will never move relative to the crankshaft. Meets SFI 18.1 specs. The latest addition to Comp Cams popular Rattler engine vibration absorber line. These are high-quality timing pointers CNC-machined from aluminum billet. Handsomely finished in black anodization with a laser etched logo on the front. The pointer is adjustable up to 4 degrees and all fasteners are stainless steel. Does TCI 870001 fit your vehicle? Mr Gasket 945G - SB-Chevy, 7/16" -20 x 2-1/4"
Mr Gasket 7845 - SB-Chevy Balancer Bolt, 7/16" -20 x 2.25"
Notes: (*) 360ÃÂ° timing marks.